A Getty Villa exhibit explores how Europeans looked to ancient Rome to understand the Mexican empire. By Suzanne MuchnicIn "Aztec Pantheon," with an eye on its Mexican American audience, the Getty is celebrating the bicentennial of Mexican independence by exploring how Europeans came to understand the Aztecs--in terms of the Roman Empire. "From the moment Europeans went to Mexico, especially Spanish conquistadors who accompanied Hernán Cortés in 1519 and missionaries who arrived after the conquest, they encountered a culture that was so unfamiliar, the only frame of reference they had was their knowledge of Roman antiquity," Lyons says. "Looking through that lens, they interpreted the Aztecs as the Romans of the New World. "The idea that a faraway place is equivalent to a distant-in-time place is a very powerful metaphor," she says, adding that the Maya have been compared to the ancient Greeks. And it had particular resonance at a time when Renaissance Europe was smitten with the rediscovery of classical antiquity. Literature of the period likened Mexico's capital, Tenochtitlan, to Troy, Jerusalem and Carthage as well as Rome. The Aztec Pantheon and the Art of Empire will be the First Exhibition of Ancient Art from Outside the Classical World at the Getty VillaThe exhibition traces European efforts to understand the New World by viewing it through the lens of its own classical past. Following Hernán Cortés's conquest of the great city of Tenochtitlan in 1520, Europeans confronted a culture that was profoundly unfamiliar. When the Franciscan missionary Bernardino de Sahagún compiled a history of Aztec culture up to the conquest, known as the Florentine Codex, he created a parallel pantheon, identifying the principal Aztec deities with their Roman counterparts: Huitzilopochtli is named “otro Hercules” (another Hercules) while Tezcatlipoca was likened to Jupiter, and so on. In this way, Sahagún and his local informants drew upon Graeco-Roman paradigms to assist Europeans in understanding Aztec religious beliefs. These early encounters with the civilizations of the Americas coincided with Renaissance Europe’s rediscovery of its own classical past. Europeans were fascinated with the Aztecs and other cultures of the New World. Artifacts from the Americas made their way back to European private collections, where they also inspired festivals and pageants, including performances of classical theater staged in New World settings. In the 18th century, scholars of comparative religion such as Bernard Picart compared Quetzalcoatl and Mercury, rejecting the demonization of what were previously seen as pagan deities. Comment: I guess it's human nature to view strange people, places, or things through one's own beliefs and biases. We're still doing it today with blacks, gays, immigrants, Muslims, et al. Heck, we're still doing it with Indians--still categorizing them as primitive people of the past, uncivilized savages. As we saw in If the Aztecs Conquered Europe, Indians undoubtedly would've misunderstood Western civilization too. But mapping the Aztec pantheon to Roman gods still seems pretty lame. It demonstrates that the supposedly advanced Europeans were no wiser than anyone else. For more on the subject, see Aztec vs. Zande and Were the Aztecs Murdering "Animals"? By Roberto Dr. Cintli RodriguezRushing toward apartheid: Arizona is speeding towards being an apartheid state. Some of this rush has to do with repressive laws (including the legalization of racial profiling and the elimination of ethnic studies) that have been recently signed by the governor. Truthfully, however, this move pre-exists the recent legislation, and much of the repression against the Mexican community here is historical in nature and exists nationwide. On the surface, it is about migration issues. Yet, if we probe a little deeper, it’s about the browning of Arizona. Probe some more and you will see that much of the hate has little to do with peoples’ legal status. That’s where English-only and the new anti-ethnic studies law comes in. It is not simply about our physical presence (red-brown), but about our culture–which is thousands of years old and indigenous to this continent. In this sense, it is beyond physical removal and even beyond thought-control; this is about our souls (they can’t have them).And:These laws that clearly single people out for both their color/race and culture are in clear violation of international laws. At the moment, whom they are singling out are not simply Mexicans/Central Americans, but generally anyone with indigenous features (and our ways of thinking). That’s why many of us say that this is the culmination of a 518-year war. This is also why indigenous leaders from throughout the continent last year unanimously proclaimed that peoples from this continent cannot be illegal on this continent. Any boycott must affirm this principle. A civilization clash: The theft of a continent is not a closed chapter in human history; nor has it become legal simply because of the passage of time). And yet, truly, no human being can be illegal on any continent. This truly is a civilizational clash–between those who believe, versus those who don’t believe, that all peoples deserve to be treated as full human beings with full corresponding human rights–regardless of where they/we live.A message of empathy to ArizonaWhen I hear of the illegal immigrant crisis taking place in Arizona I can’t help but think of a similar situation in history where this happened before. Some time ago in a land not so far away the local population welcomed a seemingly endless group of illegal immigrants, most of whom were liars, murderers, and cheats, along with some religious refugees. Sadly, it ended with the local population being murdered and their land stolen. As a Native American, I sympathize with you, Arizona, because you fear the same will happen to you as it did to the Native American population some time ago. However, while I do empathize with your situation, the immigrants you are targeting are predominantly hardworking and law-abiding. In comparison, the illegal immigrants from my story (your ancestors) were guilty of committing mass genocide against the local population and two-faced land theft. These are the ones that should be sent back, not the ones in question.Comment: Pretty much everyone has made the obligatory "Europeans were the first illegal immigrants" point. Years ago I did it myself in my "Us" vs. "Them" story. That doesn't make the point invalid, but it's time to stop offering it as if it's a brilliant new insight. It isn't. The larger point here is one worth reiterating. Namely, that most of our political, economic, and social battles represent a clash of cultures. It's not just Arizona's anti-indigenous laws, it's everything. Healthcare reform, financial regulation, civil rights, immigration, ethnic studies...it's all about who wields the power. Will it be the conservative minority or the more liberal and tolerant majority? We're battling to determine which view of the world will prevail. Will it be the white/Christian/Western view, where we drill oil wells, invade countries, and kill species with impunity? Or the inclusive/multicultural/We Are the World view, where we put people and the planet before productivity and profits? When I started working on PEACE PARTY and indigenous issues, I figured they'd allow me to write about the culture wars roiling our country. And that's proved to be the case. As Felix Cohen, the modern founder of federal Indian law, put it:The Indian plays much the same role in our American society that the Jews played in Germany. Like the miner's canary, the Indian marks the shift from fresh air to poison gas in our political atmosphere; and our treatment of Indians, even more than our treatment of other minorities, marks the rise and fall of our democratic faith.For more on the subject, see Native vs. Non-Native Americans: A Summary and Why Write About Native Americans? Here's an update on the Grand Canyon Skywalk, which I've covered since it was an idea on the drawing board several years ago. World falling for Grand Canyon Skywalk[I]f you'd totally bought into everything your intellect suggested, you might not be here at all. You'd have saved the $73 ($43.05 for the entrance fee, $29.95 for the Grand Canyon Skywalk adult ticket), you'd have avoided subjecting your vehicle to the 70-mile, 90-minute drive out from Kingman, Ariz., most of the last 12 miles on dusty-graveled or paved-but-potholed roads. Instead, you'd be back in Las Vegas winning big at the roulette table. (Or not. )And:In its fourth year, the Skywalk has become a regular attraction not just for Chinese, but for Germans, Italians, Americans from around the country. For someone visiting Las Vegas or Laughlin, Nev., it's closer than Grand Canyon National Park, and the view is nearly as spectacular, although somewhat limited in scope. Nobody I talk to is disappointed in the experience, although I would warn not to come here with huge expectations. And I haven't even written about environmental implications, impacts to the tribal members--some of whom consider this place, Eagle Point, as sacred ground. It's a $31 million gimmick, and judging by the crowds, at least from a financial standpoint, so far it appears to be a worthy gamble.Comment: I wouldn't have guessed the Skywalk would be a success. A four-hour drive from Las Vegas...12 miles on dirt roads...$73 for a 15-minute experience...and no cameras. I don't think I'd go to Mt. Rushmore or the Eiffel Tower under those conditions. But clearly many people are eager, if not desperate, for a sight of the Grand Canyon. A previous report said visitors were going away disappointed. Have things changed, or is this reporter merely putting a better spin on things? I don't know. For an impressive video of the location, go to the official Grand Canyon Skywalk site. For more on the subject, see Skywalk Brings Honor to Hualapai? and Grand Canyon vs. Grand Canyon West. By Jim Higgins Pairing 21 American Indian storytellers with graphic artists, editor Matt Dembicki has produced a spectacular color anthology of trickster tales. While Dembicki and his contributing artists have taken pains to respect the cultural integrity of the stories, their visuals never feel politically correct or preachy. Instead, reading this book creates the same excitement that discovering the Brothers Grimm or Italo Calvino's "Italian Folktales" does, only with pictures as well as words. "Trickster" will appeal to graphic novel lovers, folklore enthusiasts, storytellers, young adult readers and everyone interested in the many American Indian cultures.And:For a reminder that we are not dipping into the Western Romantic tradition here, read Eirik Thorsgard's "When Coyote Decided to Get Married," illustrated by Rand Arrington. Coyote's search for a bride shares elements with Cinderella's story, but the story's chilling ending makes it unlikely that Disney will be calling for an option any time soon. From the cartoonish artwork of Jerry Carr and Pat Lewis to the arty realism of Farritor, the illustrators offer a pleasing variety of approaches, styles and color palettes. Special visual nods go to Cherokee artist Roy Boney Jr. for his painterly desertscapes in "Horned Toad Lady & Coyote," and Paul Zdepski's hallucinatory Hawaiian demons in "Puapualenalena, Wizard Dog of Waipi'o Valley. "Comment: For more on the subject, see Trickster's Starred Reviews and Trickster on Amazon.com. Below: Azban and the Crawfish is illustrated by editor Matt Dembicki. Jennifer Yuhas Gall continues to take people to task for defending the execrable Dudesons. So, there it is. If anyone is to expend another breath or keyboard stroke attempting to persuade the nay-sayers and fence-sitters out there that The Dudesons in America episode entitled Cowboys & Findians is in fact racist, perpetuates negative and false stereotypes, and that it distorts and misappropriates Native American culture and spirituality, perhaps it’s time to clear up some of those common misconceptions, as well as provide a little bit of education to the general and sadly uninformed public. Oh, and for those of you who already know better, my apologies in advance. Bear with me while I take a brief time-out for a little NDN 101. Idiots of the world…class is in session.Comment: For readers of Newspaper Rock, Jennifer's education doesn't cover any new ground. I just like her attitude. For instance:MYTH: Satirizing or parodying Native Americans, their culture, traditions, or spirituality is not racist, offensive, or perpetuating stereotypes. It’s just a joke…lighten up. FACT: You’re an idiot. Calling something satire or parody doesn’t change the nature of what it really is, or make it any less offensive or heinous. A rose by any other name would still smell like racism.For more on the subject, see Dudesons Fans Don't Get It and Natives Protest The Dudesons. By Sarah HandelPhotojournalist Steven Clevenger got his start in 1971 in Cambodia, when he was just 22-years-old. He has covered seven wars, including those in Iraq and Afghanistan. In 2006, Clevenger began a three-year project documenting the warrior tradition of soldiers serving in Iraq. His work resulted in his book, America's First Warriors: Native Americans and Iraq. As an Osage and a war photographer, he was fascinated by modern Native American warrior culture. The definition of warrior, he writes, has been basically the same since pre-Columbian times: "A warrior is the protector of his people." The same values inherent in that code—loyalty, duty, respect, selfless service, honor, integrity and personal courage—are elements necessary for a successful U.S. Military career. Clevenger spent time embedded with Native American military members in Iraq in both 2007 and 2009. He took photographs and interviewed Apache, Navajo, Osage, Pueblo and other Native military members, capturing how their culture affected and informed their wartime service.Comment: Clevenger gives us a positive definition of "warrior." A negative definition would include the actual behavior of "warriors" such as athletes and soldiers. This behavior often involves violence, brutality, and savagery. For more on the subject, see Weaponized Drone = Indian Savage, Alexie on Warriors, and Indians Join Military for Paycheck? For more on the subject in general, see Indians in the Military. By Jonathan WalczakOn Thursday, warriors representing a sovereign nation threw up a checkpoint about an hour west of Asheville and demanded to see the passports of passing motorists. Some panicked, including a woman on a motorcycle who fretted that she didn't have her proper papers, but all were relieved when the “border patrol officers” cracked a smile. It was all part of a creative publicity stunt organized to help promote the Cherokee reservation to tourists. “So many tribal members depend on the tourism industry, as do many people in Western North Carolina, for their livelihood,” said Jennifer McLucas, who helped organize the event with The Goss Agency, an Asheville advertising firm.Comment: For more on the subject, see "Josh on the Street" Checks Papers and Paper-Checkers = Birthers = Teabaggers. First, I would like to thank you very much for your time. Your contribution to this project is greatly appreciated by myself and will hopefully become a part of a larger movement to bring graphic novels and comics written by, and featuring, Native Americans into the scope of serious scholarly consideration. 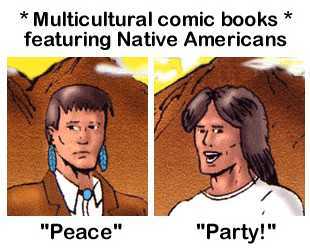 To begin, I would like to ask what inspired and led up to the creation of “Peace Party?” What brought your attention to the need for accurate Native American representation in the comic book industry?I've written about the origin of PEACE PARTY before. Basically, I was always interested in ancient civilizations, including the Aztecs and Maya. I was also an avid comic-book reader. In my teen and college years, I designed a bunch of superhero costumes, including two that looked vaguely Native. A decade-plus later, I decided to try writing my own comic book. I thought of doing something about the Greek gods, but someone said that was old hat. I remembered reading about the Hopi ("people of peace") and realized we had our own "foreign" culture in our midst. I thought about those two costume designs and decided they'd make good Native superheroes. Writing about them would give me a chance to critique mainstream America, its cowboy-style heroes, and its self-oriented values.Do you foresee “Peace Party” breaking into a larger, mass-market?I hope it will, but I can't predict that. I'm a self-publisher who has no name-recognition factor in the comics industry. I've learned a lot of marketing tricks since I published the first two issues, but I'll need them to break through the clutter. With thousands of comics are published every month, it's almost impossible to get the public's attention as an unknown. Nevertheless, I continue to believe there's a market for intelligent, socially-conscious comic books. The key will be reaching beyond the standard comics markets to people interested in this type of material. With a lot of work and some luck, I think it's doable. Research and websiteWhat sort of preliminary research was conducted about the Native American tribes that are included as well as the history of the setting itself? Did you find any difficulties when approaching tribal groups in terms of the information they were openly willing to provide? I ask because I have read about and heard about instances where Native American groups are reluctant to open up to outsiders from who are attempting to research issues surrounding indigenous communities.For starters, I did years of research before I began working on the comics. As an outsider who had no special knowledge of Indians at that point, I felt it was essential to gain as much knowledge as possible. So I went to the library and read every issue of the Indian Country Today and Navajo Times newspapers. I subscribed to the Hopi Tutuveni newspaper to get the local outlook. I read novels and reference books and watched movies and documentaries. I visited the reservations in the Southwest, including the exact locations where my first story would take place. I gingerly approached some Indians--individuals more than groups--about doing a Native-themed comic. Some doubted that a non-Indian like me could do it without stereotyping and offending their people. Others saw the need for good comics and were cautiously encouraging. A few agreed to join my Board of Advisors, which was a big confidence boost.Your Web site BlueCornComics.com provides a lot of information beyond the scope of “Peace Party.” Did one come before the other, or inspire the other?In the 1990s I was learning the power of the Internet along with everyone else. I naturally decided to create a site for my comic book. Initially I planned to save the e-mails I wrote about PEACE PARTY and post them as content. But I kept finding connections between what I was doing and broader political, social, and cultural issues. For instance, we denigrated and stereotyped Indians for 500 years and we're doing the same with blacks, gays, immigrants, Muslims, and so forth. Our violent approach to solving the "Indian problem" is the way we approach all our problems--our "wars" on poverty, drugs, terrorism, and so forth. I kept writing about these things, debating with people online, and I posted the material to share my thoughts. So my site kept growing with sections on PEACE PARTY, comic books, Native stereotypes, other Native subjects, stereotyping in general, multiculturalism, culture wars, violence, and war and terrorism. I've continued this approach with my Newspaper Rock blog, Facebook pages, and Twitter. Writing about IndiansHave you received any negative reactions of “Peace Party”--from Native Americans, tribal institutions, or anyone for that matter? Have there been any negative reaction to your not being Native while still writing the subject?Alas, I don't think many people have read PEACE PARTY, so I haven't gotten many negative reactions. A couple of reviewers criticized me for being "politically correct," ignoring the fact that Indians were savages who killed each, and things like that. I don't know if any paying readers reacted negatively. I've gotten more negative comments from my website and blog. Occasionally people will say things like, "Who are you to write about Indians? You have no idea what's it's like to be one, no right to your opinion. You don't even care about Indians, you're just trying to sell your comic book." Etc. Ironically, people occasionally mistake me for an Indian and say things like, "Why do you hate whites/Christians/Americans? Your people lost, get over it. Quit complaining and find something productive to do." Etc. I've been working in the Native media the last 10 years as well as building my website and blog. So now a lot of people know me and where I'm coming from. I'd say the vast majority of Indians appreciate and support my work. They understand the difference between a genuine friend and a phony who's in it for himself.In the lifetime of “Peace Party,” have you come across many other authors and artists who are working to bring up similar cultural and historical issues?Well, I was inspired by a lot of great comics. Classics such as GREEN LANTERN/GREEN ARROW, WATCHMEN, DARK KNIGHT RETURNS, and UNCANNY X-MEN. Personal favorites such as SQUADRON SUPREME, D.P. 7, CONCRETE, and EL DIABLO. But those were before the "lifetime" of PEACE PARTY. People are still doing socially-conscious comics--for instance, Johnson and Pleece's INCOGNEGRO. But I don't see many of them, and the ones I see often aren't as good. These days the Big Two companies (Marvel and DC) aren't doing a lot of interesting things. And it's hard to keep up in general since comics are getting prohibitively expensive. The future of the fieldHave you met many Native American authors or artists in the graphic novel and comic book industry? Do you find a larger, multicultural field of professional authors and artists contributing to this field nevertheless?I've met a few of them in person--people such as the Healthy Aboriginal Network folks, Chad Solomon, and Arigon Starr. And I've "talked" with more online--people such as Jon Proudstar, Robby McMurtry, and Gene Gonzales. I try to keep up with everything they're doing, because it usually has an edge of authenticity. Because of the demographics, there'll always be more non-Natives doing Native-themed comics. Some will be entertaining and enlightening, while others will be stupid and stereotypical. So you get everything from SKINWALKERS, RED PROPHET, and SCALPED to COWBOYS & ALIENS, RIPCLAW, and THE FOURTH HORSEMAN.Your Web site has been an exceptional source for information regarding Native Americans featured in comic books and graphic novels, as well as authoring them. From your well-versed perspective, how do you see the future of Native American comic books playing out? I have come across many great examples of Native American comic books, but do you see them making headway in a mass-market environment which still relies on fictionalized, clichéd image of Native Americans?Our society is growing more multicultural, and that bodes well for Native-themed comics in the long run. With the success of Avatar and the Twilight books and movies, we're getting closer to recognizing the viability of Native works. A couple of hit movies, TV shows, or comic books featuring Indians may be enough to break the market open. Until that happens, Native creators will have the same trouble I'm having in drawing attention to our comics. Therefore, we have to work smarter and use the opportunities available to us. Market our comics through blogs and social media. Put them online, on e-book readers and cellphones, etc. Get grants and partner with tribes to tell their stories in graphic form. Convince the wealthier tribes to sponsor more arts and entertainment products, including comic books. Despite the obstacles, the future is bright. Blockbuster movies are making comics more socially acceptable. Technology is making them easier to create and publish. And the "browning" of America is making people more receptive to the idea of Native heroes. Things can't get much worse than the stereotypical claptrap we've seen in the past, so they have to get better. For more of my deathless words, see My Racebending Interviews and Sheyahshe and Schmidt on the Radio. For more on the subject in general, see The Best Indian Comics. By Ron GrossmanCyndee Fox-Starr, whose father played in the 1950s for a local hockey team in full Indian headdress, is rooting for the Hawks but hopes the playoffs will provide a teachable moment. "Maybe others will see we're a people, not mascots," said Fox-Starr, who is of Omaha and Odawa Indian parentage. Fox-Starr is special events coordinator at the American Indian Center on West Wilson Avenue in Chicago, where it has been a season of mixed emotions. Some patrons and staff are hockey fans. Others who don't follow the sport are rooting for the home team out of civic pride—but with a tinge of sadness when they see the Indian-head logo on players' jerseys. "I'm excited for the franchise," said Negwes White, 23, a youth worker at the center. "But I don't think Blackhawks fans have any understanding of our culture." Blackhawks management's policy is not to comment on the issue. But in the team's clubhouse, the Blackhawk Indian logo is held sacred. No one steps on it, and it's kept illuminated. A few years ago, former coach Denis Savard backtracked on his use of the phrase "commit to the Indian" when trying to rally the team. 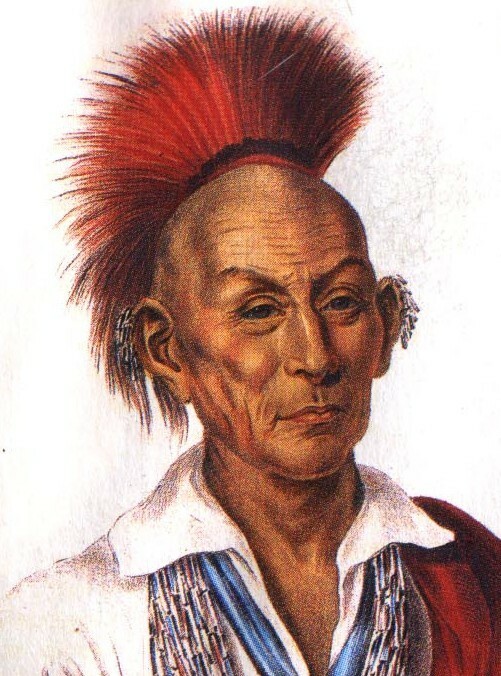 But loyal fans repeat it with gusto.And:Even Chicagoans of American Indian descent can be stumped by the question of who Black Hawk was and what he did. "I don't know anything about him," said Alex Figueroa, 13. A member of the Taino tribe, he was shooting baskets with other young American Indians in an alley behind the Indian Center in Uptown. "We didn't learn about him in school. "And:Even though the Blackhawks' use of the logo has been more subtle, it troubles Fox-Starr when she sees fans wearing war bonnets. She is bothered when crowds at sporting events clap in Indian rhythms, which have a religious significance. "Each drumbeat signifies a heartbeat," she said.Comment: Blackhawk players respect "the Indian" so much that they won't step on his image. Blackhawk fans chant "commit to the Indian." Their idea of "the Indian" is a orange-skinned "brave" in facepaint. 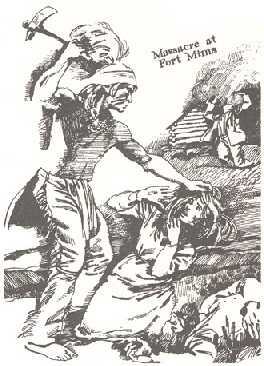 They wear warbonnets and clap in some weird tribal rite to show their love of this "Indian." Meanwhile, they don't have a clue about the real Chief Black Hawk. They're in love with a fantasy figure, a cartoon image, and they couldn't care less about real Indians. 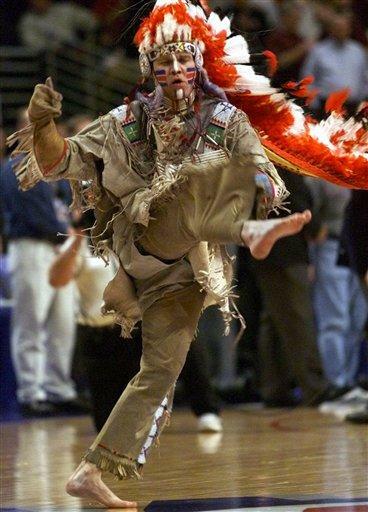 If a descendant of Black Hawk protested the mascot, they'd tell him to go to hell. This is pretty much the mascot debate in a nutshell. 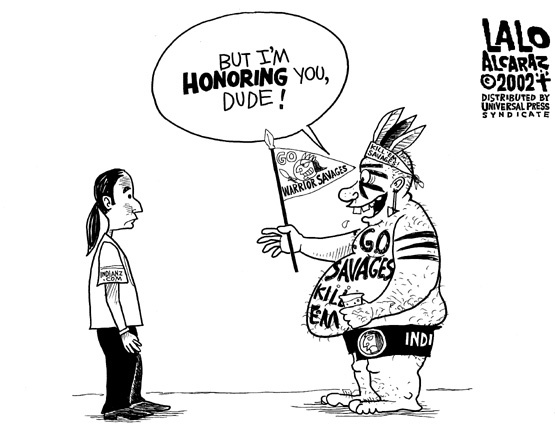 Mascot supporters cherish their stereotypical notion of Indians as primitive people of the past. Like children and Dudesons, it's all they know about Indians. In contrast, real Indians are a complete void to them: unknown, invisible, and not worth thinking about. So fans "honor" them by ignoring them. By preferring their romanticized, idealized Indians of yesteryear to the complex, conflicted Indians of today. P.S. Black Hawk is another Indian chief immortalized as a killer weapon system--the helicopter immortalized in Black Hawk Down. Native Americans and the U.S. MilitaryThe requirements for successful military service--strength, bravery, pride, and wisdom--match those of the Indian warrior. Military service affords an outlet for combat that fulfills a culturally determined role for the warrior. Therefore, the military is an opportunity for cultural self-fulfillment. By sending young tribal members off to be warriors, they return with experiences that make them valued members of their society. Finally, the military provides educational opportunities, which allow Native American veterans to return to their community with productive job skills to improve their quality of life. By Lara MarloweA representative selection of the army’s drones are displayed in a lane under the trees. There’s a Shadow, equipped with an Israeli-made camera, used mainly for surveillance, but also for some targeting, and the diminutive Raven, a battlefield surveillance drone that is launched by hand. The only weaponised drone, and the star of the exhibition, is the Warrior, a souped-up Predator that carries four laser-guided Hellfire missiles under its wings. The army calls it the Grey Eagle. “There are rules in army aviation that you have to have a North American Indian chief or tribe name,” says Lt Col Kevin Messer. Predator drones have been used extensively by the CIA to assassinate alleged al-Qaeda and Taliban militants in the tribal areas of northwest Pakistan. The army uses drones mostly in what it calls TIC (troops in combat) incidents.Comment: I believe helicopters and missiles are among the military items that have Native names. 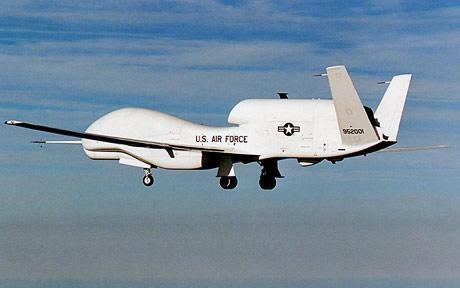 "Weaponized drones" may get Native names also because they're missiles or missile carriers. So according to the US military, Warriors are equivalent to Predators, which are equivalent to Indians. Could it be any clearer what the Army thinks? Grey Eagle, Indian, warrior, predator, lion, tiger, bear...they may not make great scientists or diplomats, but they sure make great killers. As the child said when explaining his school mascot, "We simply chose an Indian as the emblem. We could have just as easily chosen any uncivilized animal." This kid could've been a military planner instead of an eighth grader. These drones are mindless killing machines that pursue enemies relentlessly and mercilessly. Not coincidentally, that's how many Americans view Indians. So a weaponized drone is the military equivalent of an Indian savage. Recognizing this, the Army names the drones after the savages. Americans also like to think of their sports teams as mindless killing machines that pursue enemies relentlessly and mercilessly. So they give their teams the same names: Redskins, Apaches, Chiefs, Warriors, Braves, Eagles, Wolves, Lions, Tigers, Bears. They're all savages, marauders, predators--ready to do or die, kill or be killed, etc. Nice. For more on the subject, see Indians in the Military and Smashing People: The "Honor" of Being an Athlete. Below: A savage Grey Eagle Predator drone, I presume. So nice of MTV and the Dudesons to make the picture above available. With it we can brand them as racists for the next umpteen years. For more on the subject, see Children and Dudesons Believe Stereotypes and Cowboys & Findians in The Dudesons. By Rob CarsonHaving a truly righteous idea, Robert Satiacum says, is like a warm shower. That was several months ago, and since then Satiacum’s idea has grown into an American Indian crusade–not just to start calling Mount Rainier “Ti’Swaq,” but to restore traditional names of spiritual places throughout the Pacific Northwest.And:In addition to the drummers, he said, a dozen other musical groups and Native American speakers have signed on to lend their support, including Nisqually elder Billy Frank Jr., actor and Indian activist John Trudell, singers Pura Fe and Star Nayea, and the Quilleute Mask Dancers. “You don’t just barge into somebody’s house and say, ‘This is what things are going to be called,’” he said. “They stripped our culture down to the bare metal. We need to start righting those wrongs.”Why it probably won't happen:University of Washington historian John Findlay, who specializes in Pacific Northwest history, says changing the mountain’s name would be almost unimaginably difficult. For the mountain’s name to be officially changed, it must be approved by the Washington State Board on Geographic Names, which works in cooperation with the U.S. Board on Geographic Names. The state board relies heavily on community input. When controversy arises, the board tends to stay with the status quo.Comment: You can add geographic names to the long list of examples of white privilege in America. Euro-Americans have renamed places with names they're comfortable with. Natives get white supremacy thrust in their faces every day while their history and culture is erased. The Mt. Rainier case is similar to the Mt. McKinley case in Alaska. I believe people got the name of Mount McKinley National Park changed to Denali National Park, but I believe the mountain is still officially Mt. McKinley. Naturally, more people are more invested in the name "Mt. Rainier" than "Mt. McKinley," which is why I wouldn't count on the name changing anytime soon. Activists would be lucky if they could get the name "Ti’Swaq" added in parentheses. When you think about it, it's kind of like a typical mascot battle. If you change the mountain's official name, people can still call it Mt. Rainier. They can still name their tourist attractions and coffee shops after it. Really, it doesn't affect anything except people's cultural perceptions and understanding. Yet Euro-Americans will fight to the death to keep "their" mascot mountain. They know what the fight is really about. Will Euro-Americans retain their place on top of society, where they can control America's politics and culture? Or will they have to share the power with the people they conquered? In other words, it's literally and figuratively a battle to see who will be king of the hill. Will it be white Anglo-Saxon Protestants like Rainier, the Pilgrims, and the Founding Fathers, or will everyone ("we the people") finally get an equal voice? For more on the subject, see Restoring Traditional Indian Names, Renaming Mt. Diablo, and Renaming British Columbia. Iconic actor Dennis Hopper died today. A few of the tributes hinted at his interest in Native issues. When it was released, “The Last Movie” was such a crashing failure that it made Hopper unwanted in Hollywood for a decade. At the same time, his drug and alcohol use was increasing to the point where he was said to be consuming as much as a gallon of rum a day.An uneasy ride with Dennis HopperHopper also was a man who could charm while seeing the truth beneath the masks of Hollywood. His eye for modern art was uncanny, resulting in a multimillion-dollar collection. He was committed to a variety of social causes, including African American and Native American rights.Actress Joanelle Romero posted this note on Facebook:Hi Rob--Dennis was my legal guardian from age 12 to 18, oh the stories I have. Maybe a book someday, it's been in the making since I was 22.Comment: For more on the subject, see Stacey Thunder Joins Crash and The Best Indian Movies. 1. They thought of American Indians as a fundamental theme of America. 2. Their "research" consisted of simply brainstorming, stuff "we could think of," and gleaning ideas from "movies or cartoons." 3. They didn't think there was anything wrong with what they were doing. Together, these three elements reveal a group of young men who were exposed to simple stereotypes and caricatures while growing up. They simply collected their thoughts, feelings, and childhood nostalgia for Indians, lumping them together into one hot mess known as "Cowboys and Findians." Regardless of how you feel about the Dudesons or their honest intent, you have to agree that Indian stereotypes in popular culture played a fundamental role in the creation of this episode! Cowboys and Findians is a perfect example of the pernicious nature of these stereotypes. Growing up in Finland, the Dudesons must have learned about America and American culture through cultural imports--particularly film and television. They probably received a steady stream of cowboy and Indian flicks (hence the stunt with the Findians trying to escape from jail). They only ever utilize the most salient and camera-friendly elements of native culture (feathers, totem poles, canoes, etc). And thanks to popular notions of noble savagery, the Dudesons' Indians are simultaneously savage and noble (catching fish with their mouths like wild beasts but also strong and brave with "balls of steel"). Lastly, they honestly didn't think they were ridiculing anyone because in their minds, the silly stunts and Indian motifs fit with what they learned growing up. How can you find something offensive if it feels so right and you know no alternative? Right or wrong, the Dudesons would never have created this episode if it were not for the stereotypes that came before....Comment: Stephen calls this his Stereotypes Beget Stereotypes theory, which was the title of a recent posting of mine. His theory is obviously true. Like monkeys, people see something, they believe it, and they repeat it. When people repeat it often enough, it become the conventional wisdom--the standard way of thinking. Maybe Buffalo Bill understood that he was promoting misleading Native stereotypes in his Wild West shows. Maybe the audiences understood it too--although I doubt it. But anyone who knew the truth of the situation died long ago. Since then, people have been seeing and repeating Native stereotypes without the knowledge to separate truth from fiction. These days, a child's parents, teachers, friends, movies, TV shows, and books perpetuate the stereotypes without contradiction. Why would the child believe all these sources of information are lying? It defies belief that our culture would engage in a society-wide propaganda effort to stereotype Indians. Yet that's essentially what's happening. Even most adults don't get it, so it's not surprising that children get taken in. They literally don't know any better. Most children don't know about the 560+ federally recognized tribes. They don't know about pre-Columbian civilizations, broken treaties, or termination policies. They know what they see. They go with the preponderance of evidence, a logical response in their situation. If you see a hundred images of police officers helping people, you assume a police officer will help you when you need one. If you see a hundred images of planes flying, you assume the next plane you take will fly too. And if you see a hundred images of Plains Indians, you assume that's what an Indian looks like. Where there's smoke, there's fire. Anyway, great analysis, Stephen. If everyone wrote more analyses like this and sent them to me, I could take a break now and then. So keep the good work! For more on the Dudesons, see MTV vs. AIM on The Dudesons and The Dudesons, Polish Jokes, and Minstrel Shows. For more on what children think, see Students Draw What They Know and Seeing Indians Is Believing. Below: "All Indians paddle canoes." Another posting from correspondent DMarks about the music of Mike Oldfield:There's this Oldfield song, "Sentinel," from "Tubular Bells II." Both the song and album did moderately well, much better than the other Mike Oldfield songs. When it was released, I remember hearing that the few lyrics were in a Native language. I can't find which language right now. with the Indian (?) maiden dancing throughout, and historic photos of Native chiefs and others scattered among the faces of others and the video ruins.Comment: The song has a bit of a tribal beat or vibe to it. The video contrasts Greek- or Renaissance-style ruins with dignified photos of Indian leaders and a vibrant dancing woman. She combines sleek modern dresses with a breastplate and feathers. I presume she's supposed to be an Indian, and she may be one (she looks familiar). There's also a shot of tomahawks arching through the air. I don't know if the video is sending a message. But with all the elements, we can guess at one. Seems to me it's saying that Western civilization may decline, but Native people and their values endure. While we're falling down, they're still dancing. Unlike us, they feel the earth's pulse, its music. In other words, they serve as the "sentinel" of the title, watching over us like parents, hoping we'll grow up before it's too late. We took their land, so now it's our responsibility. We need to keep it safe, preserve it for future generations, as they would've done. Or maybe I'm just imagining things. Who knows? For more on the subject, see Oldfield's Native-Themed Songs and Oldfield's Song of Hiawatha. Michelle R. Shining Elk posted a defense of Saginaw Grant's role in the Cowboys & Findians episode of The Dudesons in America. She tagged me in her essay, so she wanted me to see it. I don't know if that's because I criticized the Dudesons or because I mildly rebuked Grant. Michelle R. Shining Elk: YOU CAN'T UNDING A BELL...THE DAMAGE HAS BEEN DONE. THE DISRESPECT TO ELDER SAGINAW GRANT--TACTICS USED, DEPLORABLE.As for our young people seeing this on TV and using Saginaw's role in this production as a scapegoat by saying it is damaging our youth is a copout. Child supervision begins at home, with no one other than the parents or guardians...we have become all to comfortable in this society to blame others, the world, television, etc. for the state of our youth. When, it all begins at home...it's a lazy way of releasing ourselves of responsibility when we blame television, movies, media, etc.Comment: In other words, stop picking on poor Saginaw because he gave the Dudesons credibility and cover for their racist antics? Don't you wish. Really, it's a cop-out to protest racism and stereotyping in the media? So we shouldn't do it? We should just let it happen and trust America's parents to cover their children's eyes and ears? A typical MTV show has 2-3 million viewers. Let's say a million of those are children. Rather than criticizing MTV (and Grant), Shining Elk believes a million parents should've set aside an hour to watch the Dudesons with their children. When the stereotyping became evident, they should've turned off the TV. A small number of parents (perhaps 10, 20, or 50) could persuade MTV to change its programming. That's more efficient than hoping a million overworked and exhausted parents will act. Fact is, they won't act, so pretending they will is the cop-out. It's a dodge to excuse Grant, Shining Elk, and anyone else who won't fight the problem. But wait...that's only a small part of the problem. Studies show children spend something like six hours a day in front of the TV or computer. They're watching movies and TV shows, playing video games, and browsing websites. Any of these activities may expose them to negative stereotypes. Something like 40 million American families have children at home. In these households, Shining Elk must expect the parents or guardians to set aside six hours a day to monitor the kids' activities. Because you never know when a Native stereotype will pop up on the screen. After all, who would've expected Finnish stuntmen to start pretending to be Indians? Got that, parents? You may be overworked and stressed out now, but Shining Elk wants you to find another six hours a day to protect your kids from stereotypes. It's your responsibility, so quit complaining and do it. You don't need to work eight hours and sleep eight hours a day, do you? Get a part-time job, take stimulants to stay awake, but don't let your children see stereotypes. Or you could take away their TVs and computers...forbid them to visit friends with TVs and computers...and keep them shut in at home. That would help them avoid the thousands of logos and products featuring stereotypical Indians. I don't know what these kids would do with their time, but maybe you could coax them to read. But then the same problem arises, darn it. You'd have to pre-read their books for them to make sure they don't contain stereotypes. If a child spent 4-6 hours reading each book, you'd have to spend 4-6 hours screening it first. Rather than this endless screening, perhaps Shining Elk expects parents to educate their children about Native stereotypes. That way, the children can avoid stereotypes on their own, without adult supervision. Good idea...but it took me something like 10 years of reading books, newspapers, and websites to become reasonably well-informed about Indians. Does Shining Elk think parents will undertake the equivalent of a college degree in American Indian Studies to protect their children? If so, she's dreaming. I wonder what else Shining Elk expects parents to do. Let's see...parents could demand that police protect their families from harm...or they could patrol the streets for criminals themselves. They could demand the Food and Drug Administration ban unsafe products...or they could produce their own food and medicine. They could demand the EPA clean up pollution...or they could buy gas masks and oxygen tanks and breathe their own air. You see how ridiculous this do-it-yourself approach is? Of course parents should try to monitor their kids' activities and protect them from the worst matter, but it's impossible to screen everything a child sees. It's stupid and illogical--a cop-out--to offer this as a "solution" to the problem. The real solutions are the ones I've advocated all along. Tell the racists and stereotypers that what they're doing is wrong, and why. Inform them about the realities of Native culture and history. Educate the public about the same things. Encourage people to think critically rather than swallow what they see and hear in the media. That's what we're doing by criticizing MTV, the Dudesons, and Grant for perpetuating Native stereotypes. Shining Elk can crusade for parents to regulate their children's lives while activists crusade for MTV et al. to stop the stereotyping. I'm confident that our approach will produce better results than hers will. For more on the subject, see Saginaw Grant in The Dudesons and Natives Protest The Dudesons. For why it's important to protest stereotypes, see The Harm of Native Stereotyping: Facts and Evidence. For a similar debate about parents vs. the media, see Highlights of the FTC Report on Media Violence. 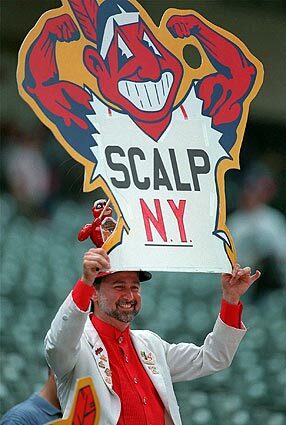 Below: If you live in Cleveland, it's not the Cleveland Indians' fault for exposing you to Chief Wahoo. It's your fault for exposing yourself. Don't complain to the team about its racist logo when you can move to another city. We appreciate your recent feedback regarding "The Dudesons In America." It is never MTV's intention to offend anyone. The series is about creating lighthearted humor, that at times, could integrate various themes as part of the overall stunt or prank. We take viewer feedback very seriously and thank you for reaching out. We understand that you had no "intent" to offend anyone, but this episode goes beyond offensive and your choice in script has opened deep wounds of racism. There are over 560 federally recognized sovereign Nations in the United States--hundreds of non-federally recognized Nations, and this episode lumps us all together in a horrific manner. We have serious issues that affect our communities. We have to constantly address the manner in which our children are taunted in schools, and the inaccurate curriculum that is taught in the school system. Since this show has aired we have received numerous complaints by Native parents that have already had to deal with their children being harassed by other children about what they had seen on the show. This episode of the Dudeson, not only encourages people to have misconceptions about First Nation people, but also perpetuates very offensive stereotypes about which we are, our spirituality, our ceremonies, our culture and customs. Had this show been directed towards any other ethnic group, it would not have aired, and there would have been a huge backlash. Yet it appears we are an "open market"–-for these kind attacks, apparently because we are a smaller population and there is a history this kind of misrepresentation with the media and entertainment industry. We researched your website and discovered that this episode violates your own campaigns such as: Fight for Your Rights, with the slogan "Speak Out/Stand Up Against Violence," to "bring forth awareness on America’s crime, drugs and violence issues," and "promoting social, political, and environmental activism in young people." You may have broken the color barrier for Afro-Americans, but this program has sent Native Americans back at least 50 years! We will no longer accept or tolerate the perpetuation of stereotypes, or the desecration Of our regalia (the offensive fake headdresses), and sacred medicines (such as the eagle feathers on that episode). There is so much more to say on this--we invite you to meet with us to discuss this in person. Please let us know when you and your office are available to meet and discuss this further. If you do not take the show out of rotation and issue an apology to the Native American people by June 1, 2010, a complete boycott of your network and all your sponsors will begin. http://www.myspace.com/aimsantabarbaraComment: Wow. Even for a non-apology, MTV's response is a little weak. Usually an offender will say something like, "We're sorry if our show offended anyone." But MTV didn't even acknowledge the offense. Indeed, its language implicitly denies the offense. "MTV never intends to offend anyone...so the 'offense' must be in your overactive imagination. Our show is known for its sense of humor, so if our irreverence bothers you, it's your fault. Quit complaining and go watch something else." I'd like to hear about the Native children being harassed because of The Dudesons. It could've happened...or it could be hyperbole. You just can't tell. Despite a few awkward phrases and mistakes, I like AIM's response. The key is challenging the so-called intent--telling MTV that its motives don't matter. As I've said many times, it's the results that matter, not the intent. It's also true that MTV would never produce a whole show stereotyping blacks or Latinos in this fashion. That's a crushing argument, which is why stereotypers never address it. Protesters should keep hammering this point home until MTV and Dudesons supporters do address it. For more on the subject, see The Dudesons, Polish Jokes, and Minstrel Shows and Dudesons Fans Don't Get It. Below: A Dudeson soars like an eagle. Ivy League Graduation AppropriationSunday was "Class Day" at an Ivy League university, and I sat with 5 of my family members, watching my little sister graduate. Class Day tradition at this school dictates students wear "funny hats" along with their graduation robes (the traditional mortar boards are saved for commencement the next day). As I waited for my sister to enter through the gates (she was wearing a flower wreath), my dad grabbed my arm and said "AJ, look at the jumbotron." I had to seriously pick my jaw up off the floor. I mean, imagine--dragon hat, football helmet, captain's hat, glittery baseball cap...warbonnet?! I felt completely disrespected and embarrassed. To these graduating students' credit, I will point out that out of 1,300 graduates, there were only two headdresses that we saw. Considering how "trendy" the headdress look is right now, and the fact that they were told to wear "crazy hats," I'm actually surprised there weren't more. But I would still argue that two is too many. Persisting....[S]ince this event is less formal than graduation ceremony, seniors have the option of "wearing ... flamboyant, lovely, SILLY, inventive headgear" (an email sent to me describing the event). It was in this festive and joyous atmosphere that two non-native individuals decided to wear feathered regalia as their SILLY headgear.And:Obviously, ethnic heritage can NOT and should NOT be represented in a SILLY manner. I am at the moment writing an essay/letter to individuals with higher authority in Yale to describe how utterly humiliated, enraged, and dishonored I felt throughout my graduation ceremony.Comment: I've often said Americans put Indians in the same category as cavemen, pirates, and fairies--i.e., mythical or semi-mythical fantasy figures. Glad to see someone else making the same point. By Larry MayerThe main reason that Native American children look up to Bears rookie Levi Horn has little to do with the fact that the 6-foot-6 offensive tackle towers over them. To the kids, Horn is much more than a pro football player. He’s one of them—a Native American who is part of the Northern Cheyenne Tribe, which is based in southeast Montana. Pittsburgh Steelers safety Tuff Harris is believed to be the only other Native American currently in the NFL. Horn, who spent three days speaking to wide-eyed kids on the Fort Belknap Reservation in Montana earlier this month, enjoys being viewed as a role model. “I really like it,” said Horn, who was raised solely by his mother. “My mom got an education, but when I was a kid I really didn’t [have an adult male role model] and I didn’t get to see any athletes. I didn’t even know of any athletes that were Native American. It’s nice to be somebody for a little kid and help them.”Comment: For more on the subject, see Tunica-Biloxi Green Bay Packer and Crow is NFL Reserve Player. Below: "Levi Horn participates in a drill during the Bears rookie minicamp at Halas Hall." By Stephen LemonsIn a hilarious spoof of Cops sure to redden the face of every cracker nativist in Sand Land and beyond, L.A.'s "Josh on the street" skewers Arizona's "papers please" law by flippin' the script on white folks and asking them for their documentation to be on what was originally Native American land. Josh the cop sets up an immigration checkpoint at the Santa Monica promenade, allows anyone of color through, but halts the pale skins. After a few he "arrests" try to flee, he says, "It's really a gray line whether we can shoot them in the back while they're running away." Comment: I had a feeling a video like this one would appear eventually. I suggested to my Native Facebook friends that someone should make one. This video is cute, but I wouldn't call hit "hilarious." It would be better with a Native officer asking for people's papers. For more on the subject, see Immigration Foes Are Liars and Arizona Laws Target the Indigenous. Redskins (confectionery)Redskins are raspberry-flavoured chewy confections manufactured in Australia by Nestlé under their Willy Wonka brand. The candy is sold as a short 4-gram bar wrapped in paper. Multi-packs and Redskin lollipops are also available. In 1996, a complaint was made to the New Zealand Advertising Standards Complaints Board about a Redskins advertisement aired on New Zealand television. 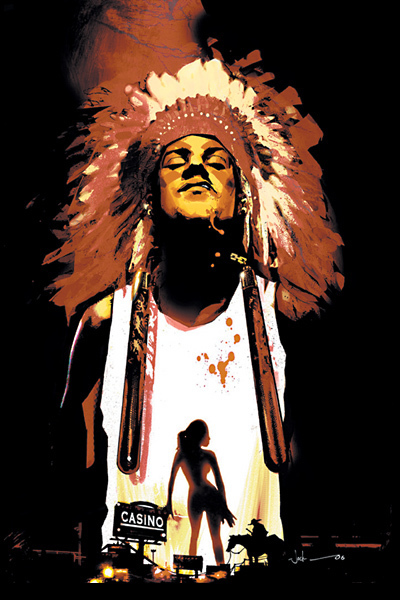 The advertisement featured comedian Mark Wright dressed in American Indian clothing and assuming a mock accent. A stereotypical drumbeat featured on the soundtrack. Despite protest from Nestlé New Zealand that the advertisement was inoffensive, the Board upheld the complaint. 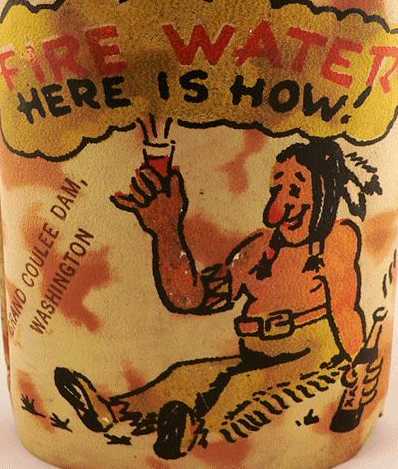 Redskin packaging formerly featured an image of a Native American wearing a traditional headdress. This was replaced in the late 1990s by a more neutral red character.Some comments about this candy on Facebook:Redskins Nestle has been selling this racist candy for decades. Why would such a product be called Redskins? Because they are red and taste like raspberries (just like real Native Americans). Somehow, these candies are still available today. The following excerpt was taken from Nestle's website discussing who they are and their commitment to diversity. "Valuing people is the core foundation of Nestlé USA’s Blueprint for Success. Diverse individuals, who reflect our consumer base, make up the tapestry of who we are as an organization. Each unique perspective is part of the fiber that weaves us together to add strength and integrity to the whole. As part of a global company serving diverse markets, we have respect for all individuals inclusive of their race, color, religion, gender, sexual orientation, gender identity, age, national origin, disability and/or veteran status." I left a question on Nestle's FB page asking them to explain the contradiction between what they say and what they are selling. The comment has not posted yet. I've actually created a power point presentation looking at racist food products. My students are against that racism is a live and well in the supermarkets. Usually after viewing the power point, I take my students to Stop & Shop and see what else they can find. As you know Aunt Jemima, Uncle Ben's are vestiges of the Jim Crow era. And yesterday one student found Eskimo Pies and a German beer company using an Indian for its logo! How about the Frito Bandito and his "cronchy" corn chips...Hehehe. Sick! Last summer I was looking for Margarita glasses. The store clerk did not have what I was looking for but suggested a set with "a cute little Mexican having a siesta as the stem." I asked her if she had wine glasses with "a cute little Italian organ grinder & his monkey" as the stem. She was horrified at my question and completely confused when I told her the Margarita glassware was an ethnic stereotype. When will it end? "Valuing people is the core foundation of Nestlé USA’s Blueprint for Success. Diverse individuals, who reflect our consumer base, make up the tapestry of who we are as an organization..."
Your commitment to diversity is admirable. How do you explain the packaging and sales of "Redskins" candy under the Wonka trade name....That appears to contradict the respectful manner you describe who you are as a company. Report Nestle USA: This is a product of Australia and not sold by Nestle USA. The name of this product was not intended to offend or be discriminatory. https://www.nestle.com.au/AboutUs/ContactUs/Default.htm.Comment: I presume the package below is the old one. The name "Redskins" is offensive engouh, but doubly so when combined with the stereotypical "redskins" images. Without the images, Nestlé could claim the name refers to the candy's red color. The margarita-glass story is telling. White people think of themselves as the norm: solid, decent, middle-class citizens. In contrast, they think of minorities as deviant: as peasants, criminals, or savages. When you turn the stereotype around, they're shocked. "How could you think of us as something strange or unusual? W-we're white!" 1) School says there's nothing wrong its whooping, dancing mascot. 2) Under pressure, school changes mascot to a less offensive but still stereotypical version. 3) School says the new stereotypical mascot "honors" Indians. The history proves such claims false. The school didn't intend to honor Indians. It intended to stereotype them. It thought the racist caricatures were funny. "Look at the red-skinned clown act like a monkey," someone probably said. "He thinks he's a human being...!" Same with the original Redskins candy. Nobody at Nestlé could've thought the red-skinned images on the package were real Indians. The company intentionally stereotyped Indians because it thought it could profit from racism. 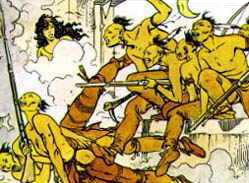 For more on the subject, see Why Americans Exploit Indians and Red·skin n. Dated, Offensive, Taboo. "We respect and honor Indians...by using a Plains chief as our symbol." This is basically the position taken by thousands of institutions: corporations, high schools and colleges, etc. It's also the position taken by thousands of wannabes who wear headdresses or display them on t-shirts. Who use them in Mardi Gras, party, or Halloween costumes. What if Indians come from one of the hundreds of tribes not located on the Plains? What if they're as unrelated to Plains Indians as Greeks are to Swedes or the Irish? Are Indians supposed to feel honored because someone honored distant members of their race? 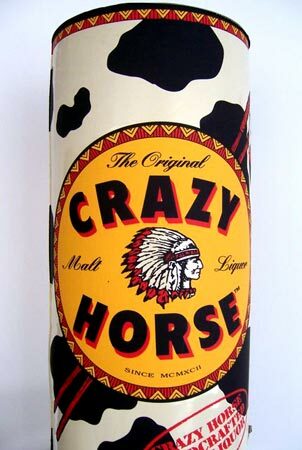 For example, we have Koff Beer "honoring" Indians with a standard chief logo. In related news, the world honored me by giving a Nobel Prize to some Russian guy. Thanks, everyone, I really appreciate it! I also appreciate the Oscars and Pulitzer Prizes you gave to some white guys. Thanks a lot! You see how silly this is? Why should I feel honored because some white person in Brazil, South Africa, or New Zealand discovered or won something? What do their successes have to do with me? Other than being Caucasian, we have little or nothing in common. In fact, this "chief worship" is an example of disrespect, not respect. The people bestowing the so-called honor are saying the equivalent of: "All Indians look the same to me. They all blend together in a confusion of stereotypes. I can't tell them apart, so I'll use a Plain chief to represent them. "I mean, what does it matter? They all wore funny costumes of feathers and skins. They all ran around killing people with arrows and tomahawks. They were savages--animals in human form. Like their fellow predators, the wolves and bears, they symbolize wildness, strength, ferocity, and deadliness. I honor these negative positive qualities." Maybe one in a hundred people knows the rich diversity of Indian culture and history. Knows that the Plains chief doesn't represent Pocahontas, Tecumseh, Osceola, Crazy Horse, or Geronimo. Not to mention Vine Deloria Jr., Wilma Mankiller, Sherman Alexie, Winona LaDuke, or Adam Beach. What the other 99 people are thinking is something like this: "Those Indians sure were brave, noble savages. It's too bad their primitiveness doomed them to die out and disappear. Now only a few Indians are left, and all they do is drink, collect their welfare checks, and fleece white people in casinos." What these chief lovers aren't thinking is this: "Yes, I know all about the Tlingit, Navajo, Seminole, Ojibwe, and Mohawk tribes. I honor them by learning about their diverse cultures and supporting their battles for legal and economic justice. I simply chose to wear a stereotypical headdress to represent them all." There's your respect and honor for chiefs in a nutshell. This pro-chief attitude is an excuse for holding false or stereotypical beliefs about Indians. "I (heart) chiefs, so I don't have to think about America's genocidal past or Indians' present-day problems. By sporting this headdress or t-shirt or logo, I've done my part to help them." For more on the subject, see Why Hipster Headdresses Aren't Okay and What's So Wrong About Kesha? By Marchell J. WesawTo this list of uses for Indians, Berkhofer could easily have added commercial marketing. Forbes Magazine quoted a judge of the 1991 Cannes Film Festival as saying, "[American Indians are] being used to sell everything from cars to chocolate all over the world." And as Michael Dorris, a Native American author and commentator notes, "In the ever popular noble/savage spectrum, red is the hot safe color." Indians sell everything, it seems. Indians' images and symbols are used to sell sports teams, sports gear, toys, margarine, air freshener, baking soda, incense, tobacco, malt liquor, automobiles, corn chips, rice, popcorn, dinner settings, carpets, soap, towels, pizza, and paper. The "Indian concept" sells, but what and why? And exactly what is an Indian? Understanding the answers to these questions is crucial to comprehending the problems "Indian labeling" causes for Native American communities and individuals. It is the "Indian" as owned and used by White society that adulterates and trivializes Native American cultures. The "Indian" is not the Native American/First American. The Indian and the Native American have nothing to do with each other, except maybe constant exploitation by mainstream society. The main difference, however, is that the "Indian" is a figment of the White imagination and is completely manipulated by it, while the Native American is a member of a sovereign nation that has been severely neglected and disrespected by White actions and policies. This difference can be seen in the fact that while the average non-native American citizen knows about war paint, rain dances, and war whoops, he or she knows very little, it anything at all, about Native American cultures and politics. Why create the Indian? The "Indian" is a flexible notion capable of being whatever the White world wants or does not want. The "Indian" can be a Noble or a Savage. Indians can be evil incarnate, scalping and torturing innocents, or they can be the pure-hearted environmentalists saving the forests and weeping over urban pollution. "Indians" can be anything and everything White policies want them to be. At this level of imaging, the Indian becomes a stereotype. Then, by manipulating and exploiting the stereotype. White society attempts to make "Indianness" part of the mainstream culture, thereby, validating the appropriation of Native land and resources. By making Native American cultures more of what White society wants, by making them "Indian" and simulating the Indian into the mainstream. Whites begin to take care of the "Indian problem." The more the Indian is like the White and the White like the Indian, the less the White has to feel guilty for. By dealing in stereotype, White society does not have to confront the reality of broken treaties and stolen lands. Historically, the White imagination created an Indian which suited the purposes of justifying land theft, war, starvation, and massacres. Because the Red Savage, the drunken heathen, the lazy good-for-nothing is contrary to the manifest destiny of the Great American Way, Americans were right in their policies toward Native Americans of war, assimilation and termination. Comment: I'm sure logos and products using Indians far outnumber those using blacks and other minorities. Why? Because Indians hold a unique place in our collective mythology. They were the "other" we had to defeat to achieve our (manifest) destiny. They were the devils keeping us from God's glory. We continue putting them on logos and products to remind ourselves of their our greatness. The Indian/Devil was great but we/God were greater. It's like a bear in a cage or a trophy on a wall: a symbol of our manhood, strength, and power. Curiously, this article seems to start in the middle. And I wouldn't have distinguished between "Indians" and "Native Americans" since it's potentially confusing. I would've called the two entities the (real) Indian and the (mythical) Savage, or something similar. Other than these minor shortcomings, though, this essay is brilliant. I've said similar things many times, but it's a great summary of the problem. For more on the subject, see The Political Uses of Stereotyping and A Brief History of Native Stereotyping. Below: Would you let this drunken savage keep a third of the continent? No, of course not. That would be irresponsible. It's our duty to save the wretch from his own ignorance and folly.